Pin collars are special fittings that lock into position on straight or T-pins. They hold parts in place during assembly when there is no room for traditional spring, bar or screw-type clamps. And, pin collars work great when parts are fragile, since they hold with very little pressure. How they work: slip a collar onto a pin. Then position the pin/collar either through or alongside parts to assemble. Slide the easy-grip knurled brass collar into place and tighten the screw with the hex wrench. Set includes 20 collars, 20 Allen head cap screws, a ball-end hex key that works at an angle for easy access, plus instructions for use. Collars are 1/4 inch dia. Use with pins sold separately below. 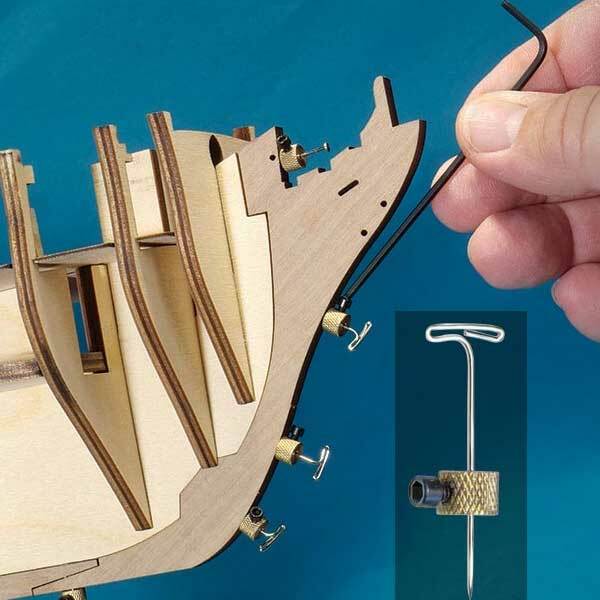 Great for assembly of model airplanes over a building board.